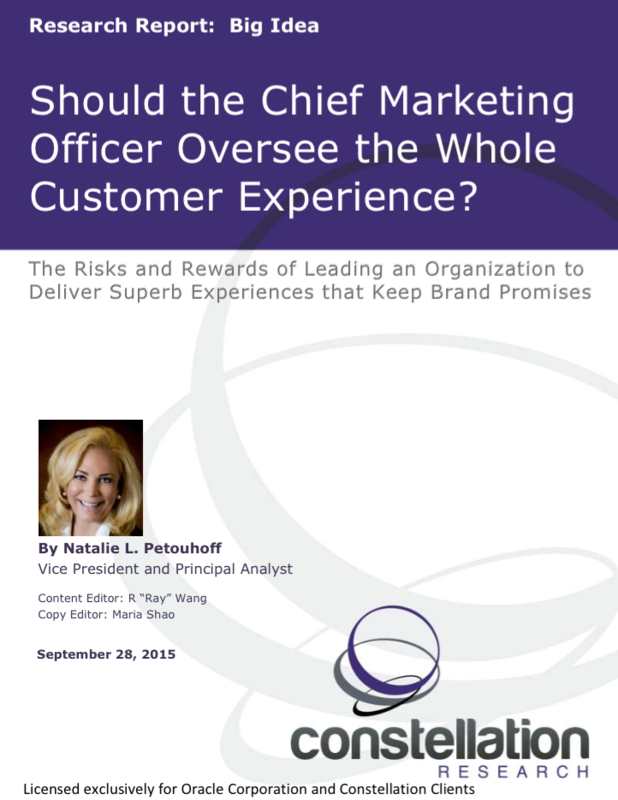 Should the Chief Marketing Officer Oversee the Whole Customer Experience? | Constellation Research Inc.
Should the Chief Marketing Officer Oversee the Whole Customer Experience? The shift to digital marketing, electronic commerce, and social media and mobile interactions continues to bring a massive transformation to how brands and organizations engage prospects and customers. Customer Experience Management is a major pillar in many B2C and B2B organizations’ efforts to engage and retain customers. As it gets more complicated to engage and retain customers, organizations are realizing there is more to the job of customer experience than many first realized. This is in part because providing superb customer experiences often means getting many different departments or functional areas to collaborate, especially when they had not been in the habit of doing so before. There are many points along the customer experience journey where an organization can miss the mark and not even come close to meeting customer expectations. However, market leaders realize the future requires proactive, digital online engagement, integrated with in-person and/or in-store experiences to support the strategy. Constellation has identified some of the requirements, rewards and risks as CMOs lead their organizations to become more customer-centric by creating and maintaining top-notch customer experiences. With this paper as a guide, leaders can create a basic blueprint to embark on a discussion about customer experience and how best to lead this key strategic initiative in their organization. This report examines the need for businesses to have a senior executive lead the end-to-end customer experience. Today, the value chain in companies has gone from products that became commodities to services that fuel anticipation of superb customer experiences that go beyond anything customers have expected previously. These new customer expectations have put pressure on companies to deliver on these experiences, which affect the revenue, margin and profits of a company. Brands are under a new type of pressure to keep the right customers and ensure that each of those customer’s experiences live up to expectations. In order to make that happen, especially in large organizations, someone has to have customer experience as their primary responsibility and also have the clout to improve it. A business considering appointing its Chief Marketing Officer (CMO) to this role can use this document for discussion and planning as it considers its approach to delivering superb, end- to-end customer experiences. This report offers insights into four of Constellation’s primary business research themes, Next-Generation Customer Experience, Digital Marketing Transformation, Matrix Commerce and Data to Decisions.